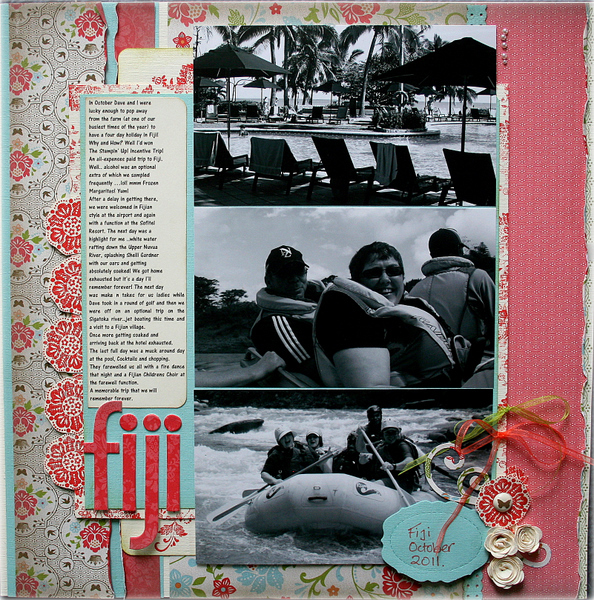 Yay its our 2nd challenge for scrapbooking at Just Add Ink and the challenge this month is to Just Add Holiday Photos! Now that could be your Christmas holidays or summer holidays or a holiday you havent scrapped yet. 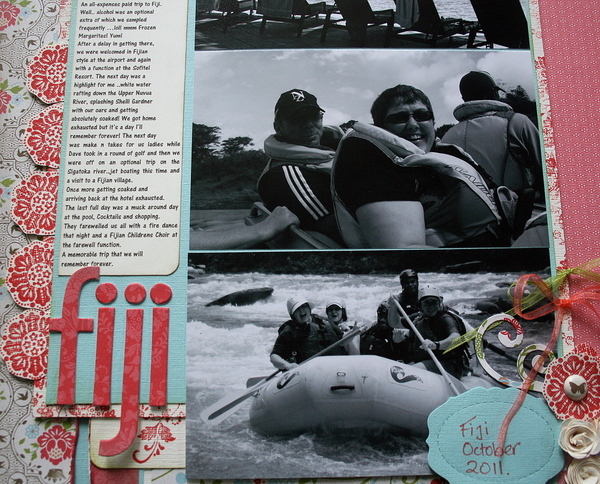 I decided to scrap some of my Incentive Trip holiday photos to Fiji in October last year. What a blast that was! 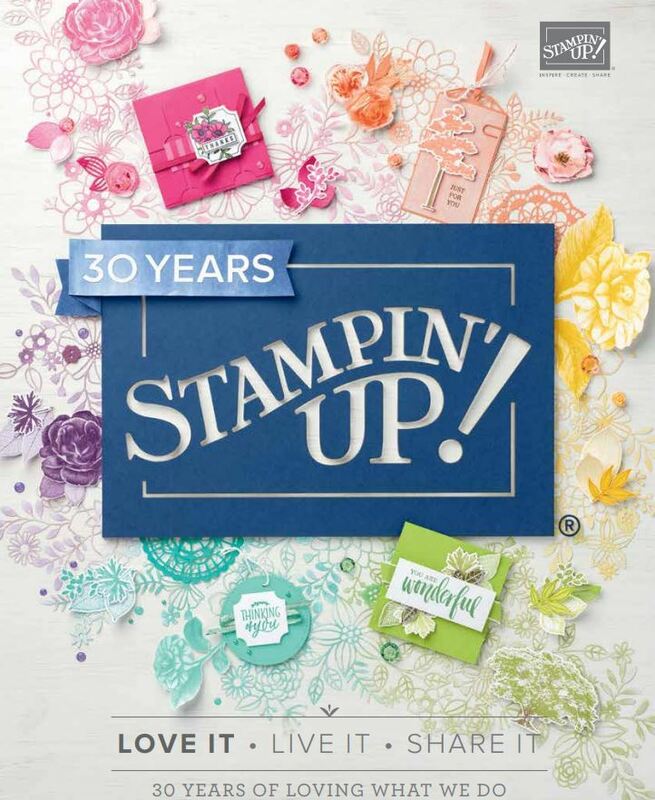 Ive used the Everyday Enchantment DSP, the matching Ribbon and brad pack and the Fresh Vintage Stamp set..all of which, are freebies (with qualifying purchase) during Sale A Bration. The bottom photo is one of my favourites when we white water rafted up the Upper Navua river..just before I was screaming at the rapid we were going down and then I was laughing at my screaming lol. The river guide was going ‘are you okay?’ and Im laughing so hard I couldnt reply. Absolutely loved it! Someone certainly looks like they had fun…. :0) l love your LO Delys, you have created a beautiful page, love all the little details. BEAUTIFUL layout, Delys. I laughed out loud at your description of the rafting; I can just imagine it. What a blast! Just got the DSP yesterday here’s hoping I can make something equally as gorgeous! Great pics to scrap and remember – I like the idea of BW – another things to add to my to do list – lol! Gorgeous layout Delys, love the papers you chose! And so jealous of your Fiji trip, it looks like it was wonderful!